Visit www.williams-sonoma.com/hawaiitrip and enter the Williams Sonoma Ultimate Hawaiian Honeymoon Sweepstakes 2018 by February 15 for your chance to win the ultimate Hawaiian Getaway for two, valued at $4,995. Who Can Enter? The Williams Sonoma Ultimate Hawaiian Honeymoon Sweepstakes 2018 is open only to legal residents of the 50 United States (and the District of Columbia) who are at least 18 years old at the time of entry. When To Enter? Sweepstakes begins on December 26, 2017 at 12:00 a.m. ET and ends on February 15, 2018 at 11:59 p.m. ET. What Is The Ultimate Hawaiian Honeymoon Sweepstakes Prize? 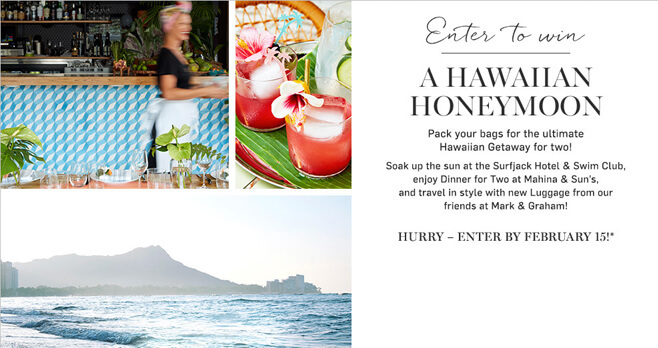 The Grand Prize consists of Roundtrip Airfare for Two, Hotel Accommodations at The Surfjack Hotel, Dinner for Two at Mahina & Suns, and Mark & Graham Travel Bag. Who Are The Williams Sonoma Sweepstakes Winners? For any legally required winners’ list, send a hand-printed, self-addressed, stamped envelope to 2018 Ultimate Hawaiian Honeymoon Sweepstakes, c/o Williams-Sonoma Marketing Department, 3250 Van Ness Ave., San Francisco, CA 94109.